Who's up for some grub? When it comes to eating out in Sheffield city centre, it can sometimes be a bit of a headache choosing where to go, simply because there is so much on offer. 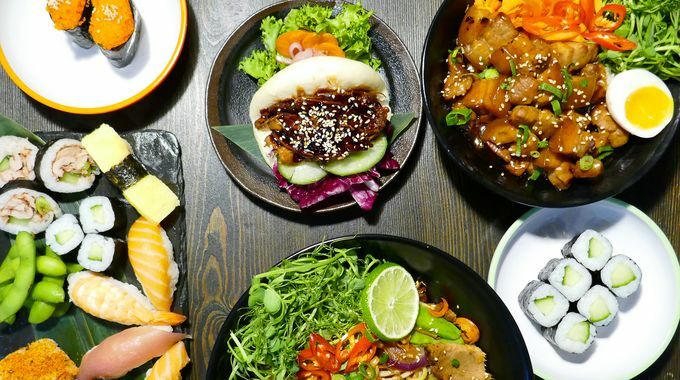 Whether you’re new to the sushi and Japanese food world, or you’re a Sashimi veteran – Sakushi on Campo Lane is your answer for fast, fresh and affordable Asian cuisine in the heart of the city (it’s literally a 2-min walk from Fargate). To make sure you get the most out of eating at Sakushi, we asked operations manager and all-round Sushi ninja Richard to help us out – whether you’re a complete newbie or you’re after something a little more exciting from your Japanese food, Richard has your back. First of all, big-ups for taking the plunge and trying something different from your usual. Japanese food isn’t as scary as it may look – and no, nothing we suggest for you is raw! It’s a common misconception that sushi is just that (when infact it's a particular method of cooking white, sticky rice). And on the menu today will be plenty of fully-cooked food. 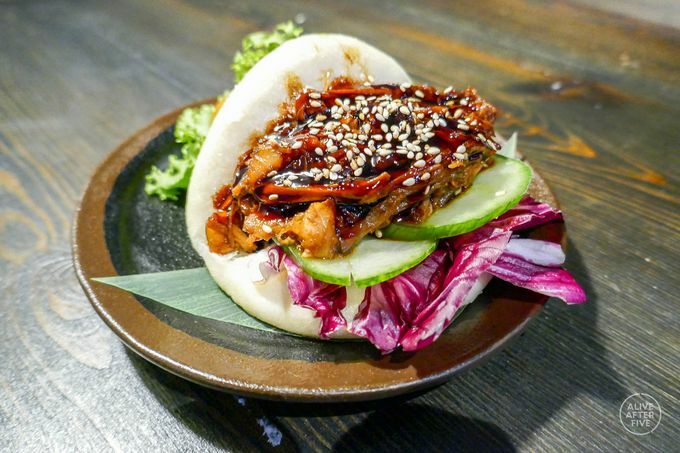 Let’s start with something small – perfectly formed and part of Sakushi’s Japanese-style tapas is Teriyaki – small enough to have as a lil’ appetizer, or even to pair up with a handful of other bite-sized dishes. This sweet and succulent sauce-drizzled dish comes as either chicken or salmon options, and gives a great tangy introduction to what’s to come. Hirata buns are also a part of the tapas option, supplying a small warm bread bun filled with either pulled pork, Hoi Sin duck or crunchy Kinoko - which consists of fried mushrooms with pea shoot, mayonnaise and sriracha. Pair with some sweet potato fries and you’re good to go! After something more? 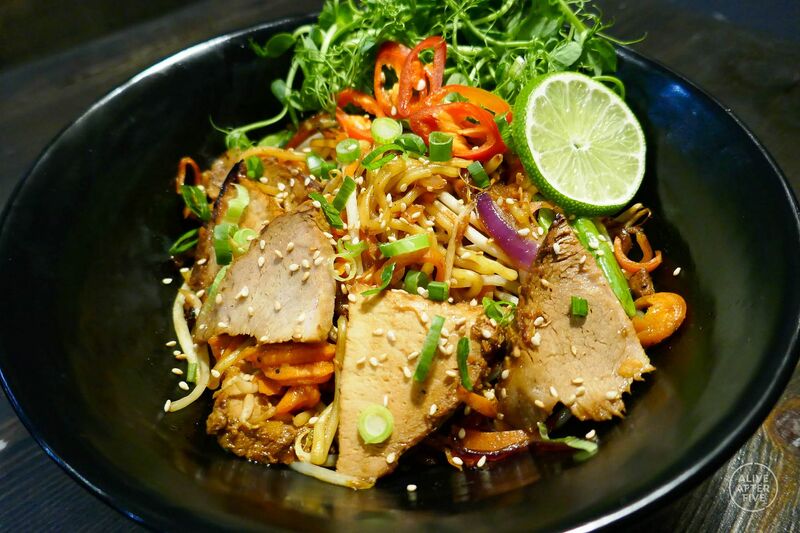 Yaki noodles are a shout: chicken or Cha-Shu pork (pork belly braised and marinated in soy sauce) with wok-fried Udon (thick) or Soba (thin) noodles in either traditional Yaki sauce or sweet teriyaki will keep you happy. Fancy a curry instead? Go for the chicken or pumpkin katsu – it’s creamy and warming in equal measure, and its spice levels are nice and safe: think crispy panko (breadcrumb) coating of chicken breast or pumpkin served with rice and a Japanese curry sauce. Wanna try some sushi? As it’s your first time, Richard recommends the aubergine Nigiri. Nigiri literally means rice with a topping, and this sushi is no different: it’s just lightly-fried and (lemon and soy-) marinated aubergine with rice. Nice. Next up, try Inari rice, which is a sweet marinated parcel of tofu, fried and stuffed with sushi rice. Kinoko teriyaki Onigiri is also worth a try: more of that teriyaki sweetness but this time with mushroom tucked into a rice pyramid! 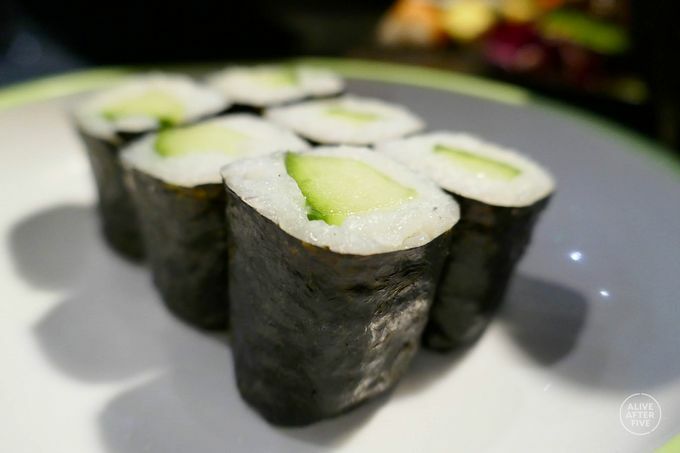 Although a pretty simple dish, cucumber and avocado Maki, which wraps sushi rice in Nori seaweed, are dangerously moreish. Alright, so you know what the deal is – you’re just after something a little different. Our expert Richard suggests giving the chilli beef don a try – it’s a rice dish with melt-in-the-mouth beef steak in a sweet and spicy sauce (if you like spice, this is for you). A fond favourite of the Sakushi staff, the pork Asado is another great rice dish, this time with slow-cooked and braised pork in a soy and ginger sauce, served with a boiled egg. After some sushi? 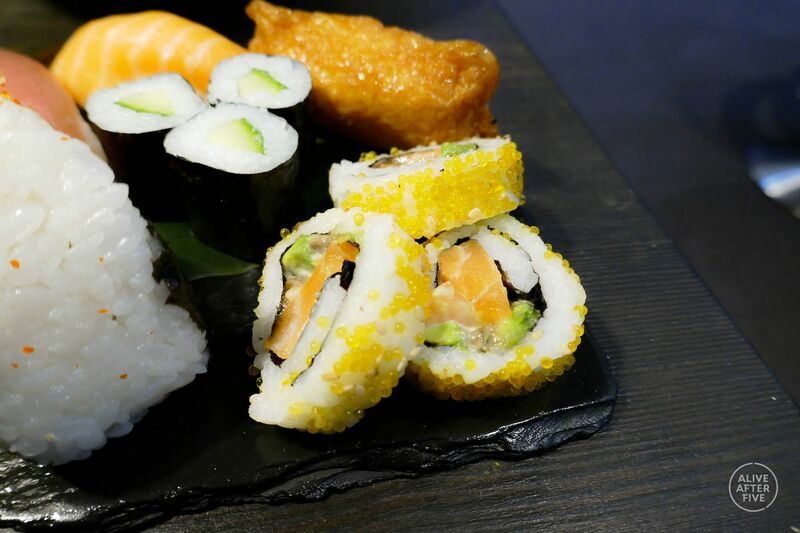 Try the Sakushi selection for a great cross-section of the wider sushi offering. With plenty to share, enjoy cucumber Maki, Ura Maki, duck rolls, Inari (rice), salmon, tuna, tomago and prawn Nigiri as well as tuna mayonnaise and edamame Onigiri – share at your peril! Let’s not lie, you know your stuff when it comes to eating sushi. That’s why Richard recommends Sashimi for your next course. Whether mixed, tuna, salmon or tuna Tetaki (marinated seared sesame tuna), these fresh raw fish dishes are pure taste – nothing added, nothing taken away. 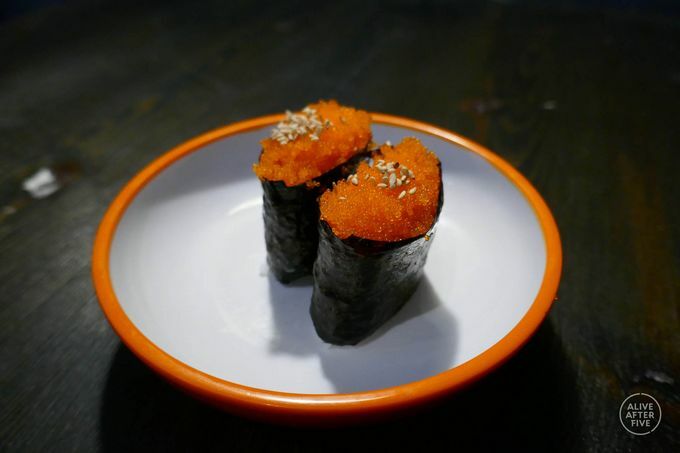 Have you tried the Masago Gunkan yet? It’s rice with smelt fish roe wrapped in seaweed – mmmm. What about the eel Nigiri? There is so much more than meets the eye at Sakushi. The chefs are constantly experimenting, and are always eager to meet the unique palettes of us Sheffield folk. Even if you can’t spot what you’re after on the menu or the sushi belt (the first of its kind in the Steel City), they’re happy to accommodate. For instance, eating vegan at Sakushi is a doddle. Have you entered our exclusive competition with Sakushi yet? You could win yourself and a pal a free dinner! Be quick! This won’t be around forever. Enter here.